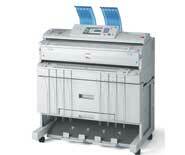 Rex Rotary MPW5100 A0 Paper Roll. 150 metres. 80gsm. Rex Rotary MPW5100 A1 Paper Roll. 150 metres. 594mm x 150m x 80gsm.